Prolong the customer journey from travelers and connect with all your customers as quickly as possible. More and more consumers turn to their smartphone when planning their trip or holiday. The possibilities of mobile are recognised by many tour operators, travel agencies, airline companies and hotel chains. But how can you use these possibilities for personal interaction with the consumer? And how can you use the available data to increase retention and benefit from all cross-sell chances? CM.com offers many solutions to increase your revenue, enrich the customer experience and grow customer satisfaction. Our sector specialist is here for you with a custom advice on how to stay ahead of your competition. Inform your customer about the possibilities for a room upgrade, local excursions of seat reservations and make payments as easy as can be. Send your customer real-time information about his journey and make sure he always has all neccessary documents on him by sending these to his phone. ﻿Wherever your customer is, he expects you to be in reach anywhere and anytime. Accessible and efficient customer service for higher brand engagement and customer retention. Keep your clients informed and make potential customers aware about your promotions and events. Increase the interaction with the customer through loyalty programs. This way you won't only increase brand involvement, but also the reach of your marketing campaigns. With CM Campaigns you can send out last minute deals or take advantage of the high open rates of SMS by sending 24-hour promotions. There are many useful ways to integrate SMS marketing into the travel industry that will benefit both business and client. Many travel companies still use outdated payment strategies and request full payment at once. Offering split payments can create a lower threshold for consumers with a smaller budget or for early bird bookings who don't like to pay the full amount months before the trip. Nevertheless multiple payments dates also ensure that a big part of the travel sum is paid faster without delays. 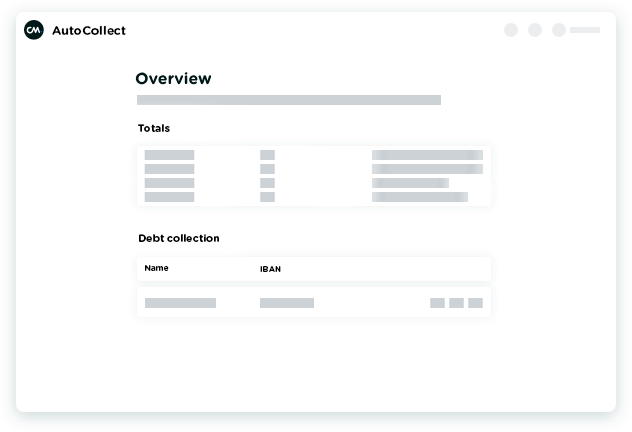 CM’s AutoCollect allows you to offer payments in terms without extra paperwork. Direct debit payments are automatically processed and missed payments are automatically rescheduled. Mobile messaging is one of the most effective ways to reach customers and offers a direct and personalised way of managing check-ins, organising bookings or greeting guests. Use cost effective Push notifications to confirm bookings, coordinate time changes through SMS and be available at any place and time on online platforms with our Customer Contact tool, so you can solve any customer issue before, during and after his travel. With Multi-channel Messaging you can offer valuable details to your customers about his reservation, travel information about his destination and send payment reminders in an efficient way. Send mobile tickets, boarding passes, travel information via SMS in a more attractive way. With CM Pages you can send attractive and easy to design mobile webpage with your SMS Campaigns. With CM Pages you can send offers about new destinations, alert guests about engaging services or send customers a courtesy message or questionnaire to rate their stay. The opportunities are endless. By adding rich content to your SMS your campaigns stand out from the competition and you’ll add an extra dimension to the customer experience. Tuifly informs their crews whether a flight will arrive and leave on the scheduled time. Calling them could disturb them in their rest scheme therefore, they’ve been sending notifications via the SMS platform of CM and notifies them of any possible schedule changes without interfering. SafariNow is the largest hotel booking website in Southern Africa and uses CM’s services for SMS and E-mail notifications. SafariNow notifies both customers and sellers of new booking confirmations, incoming quotes, inquiries and cancellations via SMS. Which payment method does your customer prefer? The answer to this question varies significantly per customer and per country. The common denominator is that payments can always be safer, easier and cheaper. And they must, if you want to meet the expectations of your customers. How do you ensure a better customer experience with SMS and Voice? When a customer switches from one telecom operator to another, PortingXS facilitates number retention for every type of phone number. We spoke with Tim Leliveld, Area Manager at PortingXS, about their smart application of SMS and Voice for an optimal customer journey. From the very beginning of business, marketers have reached out to their community to create demand for their products and services. The larger the group of people you can reach in one placement, the more value you can get from a certain channel. The reach of marketing channels has been expanding over time; starting with newspaper ads and local radio reaching a region to new ad networks such as Facebook and Google reaching half the globe. And not only the reach is expanding, the insights into the audience, as measured in actual data about the individuals, is growing. Using this information, you can create very specific segmentations that will allow marketers to target those profiles that are highly relevant and receptive to your information. Your time is valuable. Therefore, we’re excited to announce that we now have a direct connection with Zapier. Zapier adds powerful automation to over 1,300 web apps. Their tools make it simple for anyone to build code-free workflows that save hours per week. Together, we can streamline processes and simplify your day to day workflows. Albert Heijn launched an innovation in the Academic Medical Centre (Netherlands) in the field of high-speed shopping: Tap to go, with CM.com as partner for payments and identification. We spoke with Jan-Willem Dockheer, managing director of AH to go, about the future of the payment landscape and the innovative Tap to go.